There's something about classic shooters that many of today's games fail to replicate. Whether it's the clever level design, the fast-paced gameplay, or the ultra-violent tendencies, there are few games that can truly capture that magical mixture of visceral violence, and constant gratification. Admittedly, last year's DOOM managed to do this, but now we have BUTCHER which takes inspiration from the classics like DOOM and Quake. Does this game manage to carve out its pound of flesh in the genre, or should we throw this one to the wolves? BUTCHER doesn't have much of a story to it, but that's a hallmark of classic shooters. The setup is this: you're a cyborg who has been programmed to kill the last remains of humanity. Beyond that, there's not a lot of narrative here, but again, that's not really what this game is going for. If you're looking for a deep story, that's elsewhere. What I can say, without a doubt, is that BUTCHER is really fun, so let's talk gameplay! The slogan for BUTCHER is: "The only easy mode is hard." While that may be true, there are several difficulty settings to choose from. The game has some pretty hilarious comments about people who play on easy, so expect to be given some grief if you turn down the difficulty. BUTCHER employs a twin-stick style of shooting where you move with the right stick and aim with the left. Aiming and shooting feels great. By default, jump is L2 which threw me off at first, but it works just fine. Movement is fast, and the ability to jump and fall quickly between platforms makes it really easy to get around a level quickly. Enemies come in several different types, and they all splatter exquisitely into a shower of bloody pixels and gore when you kill them. You'll be doing your killing with a nice variety of weapons as well. You have a chainsaw for melee kills, a shotgun, a machine gun, and a grenade launcher that you'll eventually find. Each weapon has a nice punch to it (especially the shotgun) and offers variety in how you approach each scenario. All of this probably sounds pretty fun, but BUTCHER truly shines in its environments. The game is divided into six stages. The first five have four levels each, and the sixth is a final boss. Each time you switch stages, the environment changes a well. You'll explore a nice variety of areas, each of which has its own environmental hazards. In one level, I was dodging a giant buzzsaw that shredded enemies in its wake. On another level, I was dodging lava and laughing manically as I pushed enemies into a fiery death. It's in these moments of pure violent bliss that BUTCHER really shines. The game may not be more than a few hours, but with collectibles, speedruns, and multiple difficulties, there's plenty of reasons to come back. It also helps that I had a giant murderous grin on my face the entire time. BUTCHER uses a retro pixel art style that really goes the distance, offering the option for a CRTV filter to really give it that old look. Don't let the looks fool you, though, because there's a lot going on in this game's presentation. For starters, the death animations are a treat. Watching your foes explode into chunky bits, or burn up in fireball of their own fuel is nothing short of immensely satisfying. Blood is the name of the game here. 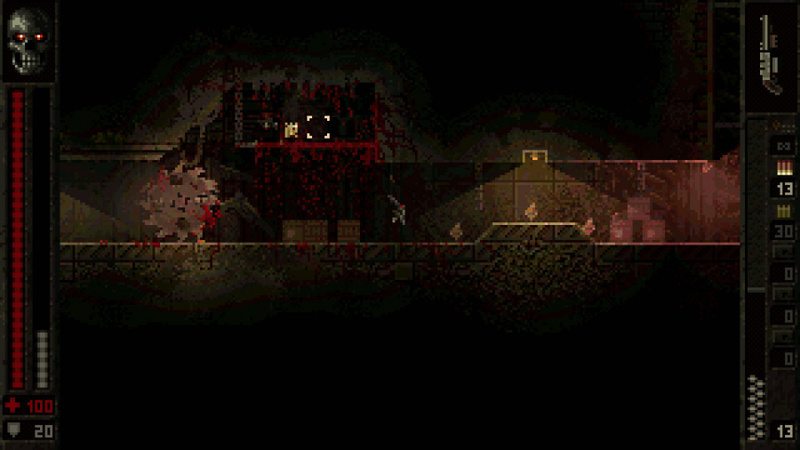 When enemies are killed, countless pixels of blood gush across the ground and walls, painting the town red as it were. It looks great and flows better than blood in most other games. It's truly spectacular if you have the stomach for it. The blood sticks around, which makes for some epic moments where your trapped in a room for a wave assault. By the time the doors open, you'll be hard-pressed to find any surface that isn't drenched in sweet crimson pixels. Combine this with the environmental hazards, and there's a lot more detail and action to this game's presentation, even beyond the basic run-and-gun moments. The cherry on top of this bloody sundae is the soundtrack. I would be remiss if I didn't mention the thumping beats and edgy retro sounds that accompany your massacre party. The music sets an insane rhythm to an already insanely fast game, and the two combine to create a powerhouse of pure satisfaction and intensity. You may be wondering if there's anything I didn't like about BUTCHER, and you would be right to ask. The core of this game is awesome. The style, the retro feel, the bloody gory goodness, it's all great. The only issue I have, is that there's not a lot of depth to it all. The run-and-gun is excellent, the graphics are cool and the music is exhilarating. The lack of story hurts, only because a machine programmed to wipe out humanity is a great premise. The relatively short game time is balanced somewhat by the speed running nature of the game's levels and the collectibles, but it's still not a ton of content. Finally, more enemies, bosses, and weapons would have been welcome additions. None of these things changes my overall opinion, however, that BUTCHER is an really fun horror shooter that does justice to the games it was inspired by. For the low price of entry, I'd say it's the perfect way to distress after a long day, or give yourself one heck of a challenge on higher difficulties. At the very least, we need more games like this in the world, so I would recommend supporting the developer and giving this one a shot. Trust me, it's love at first kill.